Almost all fixed asset depreciate (with land an exception). So every business should know how to calculate the depreciation charges on their fixed assets. Depreciation can be calculated manually but a spreadsheet management software like Microsoft Excel simplifies the whole job for you. Depreciation can be seen as the gradual or total fall in the value of a fixed asset. It can also be defined as the wear and tear of any fixed asset which results to loss of value. In the other way, depreciation is also seen as that part of an asset consumed annually throughout the period the asset is used by the company. This is the chapter 5 of the Free Microsoft Excel Online Tutorial Series at Microsoft Tutorials. This chapter 5 has two parts and this is part 1. In this part, I will explicitly explain Depreciation, Causes of Depreciation and how to calculate depreciation charges using the Straight Line Method and Double Decline Balance Method manually and with MS Excel syntax step by step. Each of these methods has a unique formula as you will see in this part 1. In Part 2, I will explain how to calculate depreciation charges using the Sum of Years Digits Method manually and with MS Excel. In the previous chapter (chapter 4), I explained how to design Stock Ledger Account in MS Excel. 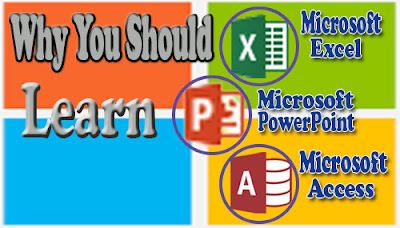 Also see the full tutorial course content of this FREE Microsoft Excel Tutorial Series. Continuous use of a fixed asset results in wear and tear which leads to loss in value of the asset. Whether an asset is in use or not, its value tends to depreciate with time. A fixed asset tends to depreciate if it is no longer produced or used. This type of depreciation is mainly caused by change in technology. For example, a change in the model of cars, phone, etc. Some physical factors like rain, sunshine, etc. cause damage to assets like building, plants and machinery, etc. and as a result leads to loss in value. Before you go ahead to charge for the depreciation of your fixed assets, there are many factors you really need to consider. I will be using some of these terminologies in this chapter. So you need to get used to them now. This is the amount required to procure or purchase an asset which must be greater or equal to the salvage or scrap value. 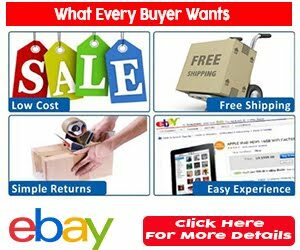 This is the worth or the amount an asset can be sold after its useful life. It is also known as the Residual Value of an asset. This is the length of time an asset is expected to be in use before it becomes a scrap. In other words, estimated useful life is the number of periods (which can be in days, weeks, months or years) it takes an asset to depreciate to its useful life. There are many different methods of calculating depreciation charges on a fixed asset, but I will only list and explain the three most common methods and also show you how to do the calculation both manually and using Microsoft Excel Spreadsheet. 1. Straight Line (SLN) Method. 2. Diminishing Balance (DB) Method or Double Decline Balance (DDB) Method. 3. Sum of Years Digit (SYD) Method. In this method, a specific amount of money is charged year after year as the asset depreciates over its useful life. Now, let me show you a practical example of how to calculate the depreciation of an asset using the Straight Line Method. An Android phone was bought for $20000 with 5 years useful life after which it becomes a scrap with $5000 value. Calculate the annual depreciation charge using the straight line method. This means that an annual depreciation charge of $3000 will be charged on the asset for 5 years. Prepare your worksheet as shown below. =SLN(B1, B2, B3) then press the enter key. Excel returns $3000 in cell B4. Under this method, a specific percentage is charged to the balance of the asset as the asset depreciates. This means that the depreciation charge on the asset will be higher in the early age of the asset than on its later age. Period is the age of the asset. Rate or Factor is the Depreciation rate of the asset usually expressed in percentage. This time, I will show you a practical example of how to calculate the depreciation of an asset using the Double Decline Balance Method. 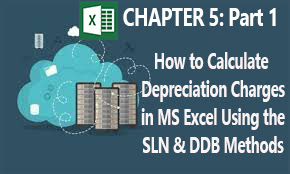 The depreciation charge values for the 4 years using MS Excel DDB syntax are slightly different from the values gotten when manually. The difference results from the approximation you make when solving it manually. When solving in real life challenges, avoid approximating values. Use the values exactly as given by your calculator. This is the end of part 1 of chapter 5 of this online tutorial series. In the next part (Part 2 of chapter 5), I will explain how to calculate depreciation charges using the Sum of Years Digits and then give you some practical exercises.